Noticing a trend with my summer outfits? 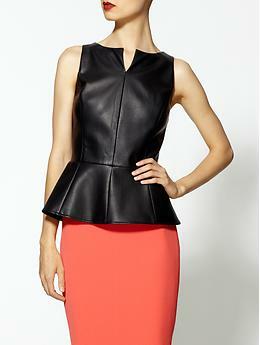 I'm slightly obsessed with peplum (as documented HERE and HERE) and scallops (last seen HERE). One of my favorite things about being a girl is being able to wear cute detailed pieces. These red shorts are adorable on their own, but when paired with an eyelet peplum top, the level of femininity skyrockets. I kind of felt like a 50s housewife in this outfit. Anyone else getting that vibe? Maybe it's the puckering on the top or the fact that it sort of looks like an apron. Either way, I embraced it. There are few pairings that scream "summer" more than chambray and white. It's such an effortless combo but the end results are crisp and cool. Add a few pops of color and you're good to go. I'm a complete sucker for a ruffle detail on anything... and then I spotted the $15 price tag and was REALLY in heaven. Cute shirt for under $20! Amazing. Have a great Monday! Hope everyone had a great weekend! Alone, this romper might have looked a bit sloppy because of its slouched fit and casual (and easily-wrinkled) material. But simply add a crisp white blazer and your favorite pair of wedges and voila, you've got yourself a bright and summery outfit perfect for date night or girls night out. How do you dress up your casual pieces? It's all in the details. What immediately drew me to this shirt was the embroidery on the scalloped edges. Feminine and dainty, I just had to have it. Per Friday's post, I was originally inspired to pair the top and shorts with a pair of fringed sandals and some colorful accents. Considering I don't yet own this adorable Rebecca Minkoff bag, (it's on the birthday wish list) I opted for a neutral straw bag and my new wedges. Accessories were minimal because it was just too flipping hot out to wear anything other than a few basics. How would you style this top? Few things excite me more than dessert. And when said dessert is fairly healthy, well cue the orchestra and light the fireworks. OK so maybe sweet stuff doesn't have the magical effect on you as it does me. But that won't stop me from ranting and raving about the fruit salsa I brought to a backyard BBQ yesterday. Dice fruits and add to a large bowl. Stir in sugar and strawberry preserves and mix well. Refrigerate for at least 15 minutes and serve with cinnamon sugar chips. I used store bought cinnamon pita chips but you can easily make your own by cutting 10 tortillas into quarters, spray with butter and top with cinnamon sugar. Bake until lightly browned and crispy. What was on your holiday spread yesterday?